Emperor Yuan of the Han Dynasty (206B.C. - 220A.D.) had so many beauties in his palace that it was impossible for him to see them all. Therefore he ordered some artists to paint their portraits, from which he would choose his favorites. In order to win the emperor's favor, the palace concubines all bribed the painters. The largest bribe was a hundred thousand coins; the least was fifty thousand. Wang Zhaojun was the only one who would not participate. Consequently she never had a chance to see the emperor. Later, the chief of Xiongnu (Hun), a nomadic tribe in north China, came to pay respects to the emperor and asked him for a beautiful woman to be his queen. The emperor checked the portraits and decided Wang Zhaojun was to go with the chief. Before her departure, she received an audience with the emperor, who was astonished by her dazzling beauty, finding that she surpassed all the other palace beauties. Apart from her beauty, she was graceful and eloquent. The emperor's regret was beyond measure. But since she was already promised, and the Xiongnu chief already informed, what could the emperor do? He was supposed to keep his word to foreigners. He could not replace her with another woman. After a thorough inquiry, many painters were executed in the marketplaces, their bodies exposed to passers-by. The executed painters, their property confiscated and an itemized list made of their assets, all turned out to have been millionaires. Among them was Mao Yanshou of Duling, who was expert at painting lifelike and accurate portraits. Some other artists were skillful at painting animals and birds, but could not portray people as well as he. There were also artists who were especiallly good at applying color. They all died the same day, reducing the number of artists in the capital. 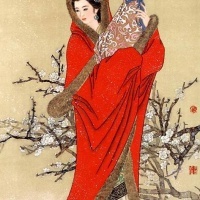 Note: Wang Zhaojun, she is considered one of the most four beautiful women of the ancient China.